This was a really good book. It was released to tie in to Zelda's 25th anniversary in 2012 and to tie in to the latest Zelda game also released in 2012: Skyward Sword. As a result the first 3rd of the book focuses on Skyward Sword, before then going into a detailed discussion of the history of Hyrule, including an official timeline and order for the games (which I'm sure will please any Zelda fan). This is then followed by a large concept art section and finally there's a sample of the Skyward Sword manga. The Skyward Sword section was nice and interesting, and it was interesting to see all the different designs for various characters, including Zelda, Fi, Link etc. but this also included the different locations and the minor characters as well, such as the Surface races and the people who inhabit Skyloft. It was nice to see all of this but I do wonder if it was all necessary and the pages could have been used for something else. 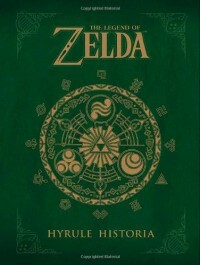 Next, the timeline section of Hyrule Historia was undoubtedly interesting and useful. It finally provides fans of the series with a definitive timeline for the games and then goes details what happened in each game and how it all relates to each other and the history of Hyrule, complete with pictures from the games and other tidbits of information. The concept art section was delightful as well. It was nice seeing some of the concept art for all the different games, and I only wish this section was bigger and there was more art for each of the games, particularly the 'bigger' games such as Ocarina of Time, Twilight Princess, Majora's Mask, Wind Waker etc. And if maybe there was more general secrets or background information too. And the preview of the skyward sword manga was a nice addition, but I don't think it's something that will necessarily appeal to all fans. Overall, it's a good and interesting book, I just wish that there was a bit more background information and more art etc. from other games rather than just the focus on Skyward Sword, although I understand why there is a focus on that game.